When I first started to really get into Kubernetes I would go find the docker image to various necessary programs and just create a template file around their code. This was easy enough and seemed like a good option. Depending on your needs, this is a fine direction to go. However as time went on I would keep reading about Helm and see that some of the applications I was creating templates for already had extremely well created templates in the form of Helm Charts. With this realization — and me being a lazy developer that wants to increase my development speed — it was time to learn Helm! What Is Helm? What Will It Do For Me? First, in case you haven’t read a ton of articles about Helm already, here is all you need to know about Helm. Helm is a Package Manager for Kubernetes. If you come from any languages (and like word puzzles) here is something for you to relate to. NodeJS is to Kubernetes as NPM is to HELM! Ruby is to Kubernetes as Gems are to HELM! Swift is to Kubernetes as CocoaPods are to HELM! Java is to Kubernetes as Maven is to HELM! A Helm Chart is a Helm Package. This is the chart or “instructions” of how to put together your releasable package. Tiller is a server that runs inside your Kubernetes Cluster anytime you install Helm. Tiller manages installations of your Helm Charts. As Tiller installs containers into your Kubernetes Cluster on your behalf, security around this process should be a high priority for you. Once you have Helm installed in your Kubernetes Cluster and everything going, you can add big functionality with a single line of code. Want Redis (Or Anything Else) In Your Kubernetes Cluster? BOOM! A Redis installation with a Master/Slave configuration for scalability and Persistence Volumes and, for giggles, even a Prometheus metrics exporter. You want more options? Wordpress? Spinnaker? Sonarqube? PhpBB? Mysql? Jenkins? Drupal? Yup, there are tons there for you to enjoy. I’m Sold! How Do I Install Helm Into My Kubernetes Cluster?! Great! It is time to start talking code and installation scripts. There are two directions that you can go when installing Helm into your Kubernetes Cluster. The first is a fairly vanilla install that gets you all the basics but may not be as secure as you’d want for your production cluster. The second will be much more secure using TLS to lockdown your Tiller to Helm connection. In the remainder of this article we are going to look at how to get a basic install working. This sort of installation is best if you have a very locked down Kubernetes Cluster already or if you are running your Kubernetes Cluster in MiniKube (aka, not production). In my next article I am going to focus specifically on installing Helm with TLS as it is a bit more involved. To be transparent, Helm does have very good documentation on the installation process, however things just don’t always go as the documentation promises. As such I’m going to add some lessons learned that slowed me down so you don’t have the same issues. Update: I published the second article! To install Helm into your Kubernetes Cluster you’ll first need a Kubernetes Cluster. I’ve created some scripts to make this easier as creating the Cluster isn’t the purpose of this article. If you go to your Google Cloud Shell scripting you can enter in the following commands to create a Google Kubernetes Cluster ready for Helm. This will take a moment to complete but when you’re done you’ll have a Kubernetes Cluster ready and waiting. With your Kubernetes Cluster up and running you can start adding in Helm. Below you will see the actual scripts (with notes) necessary to add a very basic Helm installation into GKE. Now that you’ve seen the code necessary, you can be lazy and just run a script to do the install for you. You’ll see everything run through your Shell console very quickly but in the end you should see the following lines, showing that Helm was installed completely. You can even do a double check by running a basic Helm command and see the output. Now with Helm installed, let’s use it! In the scripts to follow we are going to install Redis into our Kubernetes Cluster with some production values recommended by the Redis Chart maintainers. This will only take a moment but we can see that the Redis Chart was successfully deployed by running the following command. 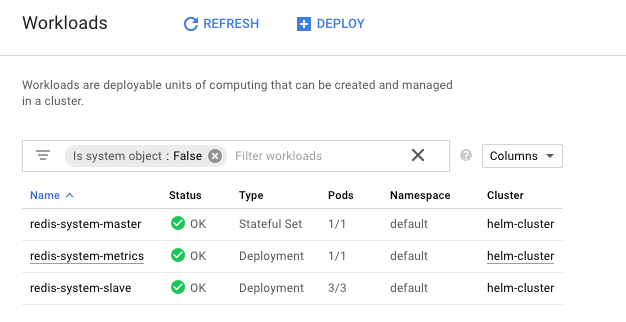 If we give the Pods a moment to startup fully you can return to your Kubernetes > Workloads view and see the Pods all ready for you to interact with them. That’s it! A production quality Redis instance installed and ready for development in just moments. This is huge! And all thanks to Kubernetes and Helm Charts. There are more things that Helm can do through the command line interface. This article isn’t intended to be a compendium of Helm knowledge, but more of a starting point that gets you going on your Helm journey. I’m going to give some quick commands though that I’ve found helpful beyond the install command. Allows you to search through the Helm Repo’s charts for a chart by name. Just a quick way to get you were you need. As we’ve seen this will list the deployments you have within your Kubernetes Cluster that Helm is managing. Will delete a Helm Chart from your Kubernetes Cluster. Will rollback an upgrade to your Helm Chart to a previous chart. This is super helpful if there were unintended consequences to an upgrade. A full list of commands can be found here. That’s it, you have the basics of getting going with Helm with Google Kubernetes Engine. I am already setting up the next installment of this series to go into how to secure your Helm installation with TLS. From the docs, my own struggles, and the amount of questions online around the subject I can assume more help here will be beneficial to everyone. For now keep moving forward and make sure to share your feedback!